Hudson High School Stream Restoration. In the early 1900s, to accommodate farming and development, this stream was dug out, straightened, and converted into a farm field drainage ditch. As a result, the stream suffered significant erosion and a tremendous loss of habitat. 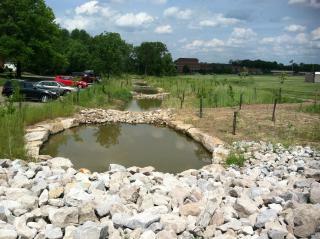 Restoring this stream enhances conditions for fish and wildlife; it improves our lives too! Restored habitat reduces erosion and improves water quality. Hudson High School students get hands-on science experience. Nearby flooding is reduced because two million gallons of water that once quickly flowed downstream is now retained and filtered in a functioning wetland. Hudson High School’s Land Lab gets even better! Who made this project happen? Hudson High School teachers came up with the idea to create this Land Lab and restore the stream. The City of Hudson recognized it as an opportunity to improve stormwater management and flood protection. Funding was provided by the Ohio EPA, the City of Hudson, the Tinker’s Creek Watershed Partners, and the Cuyahoga RAP. The project is managed by the Cuyahoga County Board of Health and strongly supported by Hudson High School. Construction was completed in August 2012 and native plants were installed with the help of Hudson High School students. The restoration is a regenerative process. If cared for and protected, the ecology of this stream system will continue to improve, evolve, and adapt over time. Students will help with the monitoring.